We have so enjoyed all of the participation from our readers over the past month of One Book, and we’re greatly anticipating J Ryan’s talk at the end of the week. 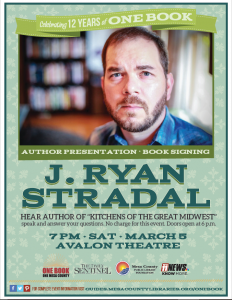 J Ryan will speak at the Avalon Theatre (645 Main St.) on Saturday, March 5th at 7pm. The doors will open at 6 pm, and there is no charge to attend. J Ryan will sign books following his presentation. He’ll also be answering questions that we collect from our audience. If you have one (or several) questions for J Ryan to consider, you can email ask@mcpld.org with the subject One Book. We’ll also be collecting them before the talk that evening. If your questions are literary in nature, you might also want to bring them to our Literary panel on Tuesday, March 1st at 6pm. Our panel of Colorado Mesa University English Professors Jennifer Hancock and T.J. Gerlach, along with Il Bistro Italiano chef and owner Brunella Gualerzi, will discuss the book as a work and its literary merits. Lastly, the Library is holding a Fundraiser, Table of Content, inspired by Kitchens’ emphasis on fine food and beverage. Table of Content takes place at the Central Library on Friday, March 4th at 6:30pm. Tickets are $30 for one or $50 for two, and admission includes signature craft drinks and dishes from local restaurants, live music, and the opportunity to chat with our guest, J Ryan. It’s bound to be our most delicious event yet.